I use chicken stock a lot. It gives great flavor to all kinds of dishes and there is absolutely no reason to buy chicken stock once you know how incredibly easy it is to make. 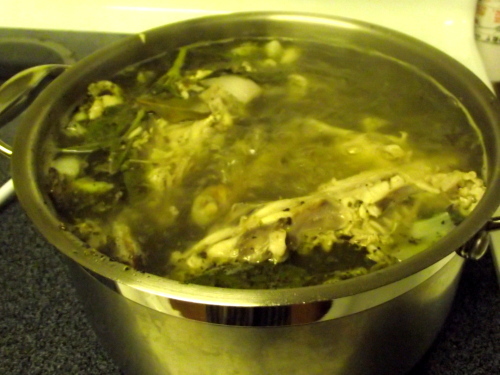 Next time you roast a chicken save the carcass and you’ll soon have a freezer full of savory chicken stock at your disposal! Throw everything into a large stock pot and boil gently for at least 2 hours, topping up the water level as needed. Strain stock and separate it into smaller meal size container to cool and then pop it into the freezer. Yes, I’m serious. That’s all there is to it!